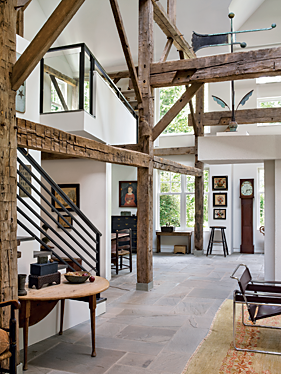 Looking toward the front of the house, three theorems align with a painted tall clock to create strong parallel lines echoed in the doorway and barn beams. The theorems were collected over a period of years and are among the collector’s favorite woks. The Windsor stool below has an oval seat, more unusual than the round seats typical of the form. Though the clock is not Shaker, it emulates the aesthetics in its simple, clean appearance, which the collector loves. Under the bench is a miniature six-board chest painted white and dated 1806. 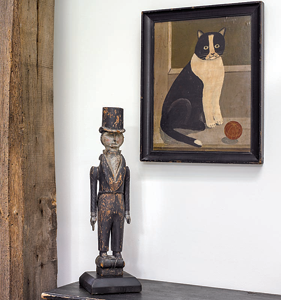 Though the collector wasn’t looking for a weathervane when she found the one now placed above the fireplace, the proportions of this one are perfect. With its tall leaves and standard, and its placement above eye level, it brings attention to the peak of the ceiling. The focal point of the main living space, which blends historic and modern furnishings, is the double portrait of the Hathaway children attributed to Sturtevant Hamblin (1817–1884). When the collector purchased the painting, it was a significant financial commitment; when it arrived for approval, however, she knew it would remain with her, and she has never regretted her decision. The painting was exhibited in 1992 and published in A Loving Likeness, American Folk Portraiture of the Nineteenth Century (Gallery at Bristol-Myers Squibb, Princeton, N.J.). Visible toward the back of the image is an eighteenth-century wing chair that retains its original under-upholstery, a rare survival; a linen fabric slipcover currently protects the material. Placing objects within her home has always been purposeful, so as to ensure straight lines of uninterrupted vision. “When I walk in,” she says, “I want to see clearly through to the other end of the house. That’s why there’s nothing obstructing the sight lines.” To further the sense of open space, curtains are not used, because they interrupt the clean lines of the window frames and the view of the scenery beyond. When the collector had knee surgery several years ago during January’s Americana Week, several friends called to tell her about a portrait of a young girl in red that a dealer at the Metro Show had in his booth. She called the dealer, he sent a picture, and the painting now hangs in her entry. 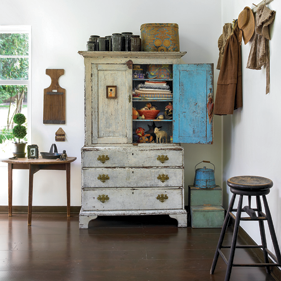 The graceful painted chest with bun feet was originally green and has oxidized to a soft black. The miniature dome-top trunk is in the best original pale blue paint. The pink color on the treen bottle is most unusual for an early color. When visitors enter the house, this sofa is the first thing they see. The sofa has a rope bottom and is covered in an early linen fabric. The pair of portraits at the end of the hallway is attributed to John Brewster (1766–1854). The owner designated that space as her office, using the large surface of a painted hutch table as a desk. “Some people want polished mahogany, but I prefer the silky feel of a scrubbed maple top,” says the collector of her Queen Anne drop-leaf table. 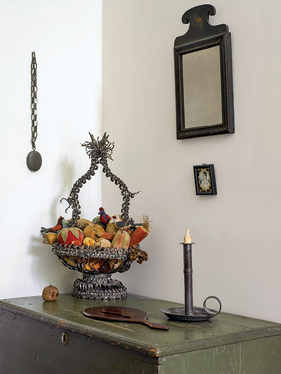 Adorning the wall along the staircase is one of the owner’s favorite pieces, an Angel Gabriel wooden weathervane. Besides its aesthetic appeal, it is not factory produced, and is most likely unique. At the very top of the visual array is a mounted, hand-sewn rug. Checkerboards line an upstairs hallway, iterating the geometric visuals within the interior space. A collection of chip-carved and decorated boxes display a range of textural effects. The owner purchased her first chip-carved box (on top) from the late Pat Guthman, who started her on the “chipped carved quest.” Another friend, Helaine Fendelman, introduced her to tramp art. 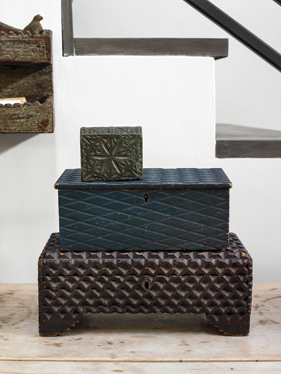 The collection of boxes holds more than aesthetic interest, it also represents connections: The blue middle box is carved like a pleated textile and the brown box underneath is a cross between chip carving and tramp art. 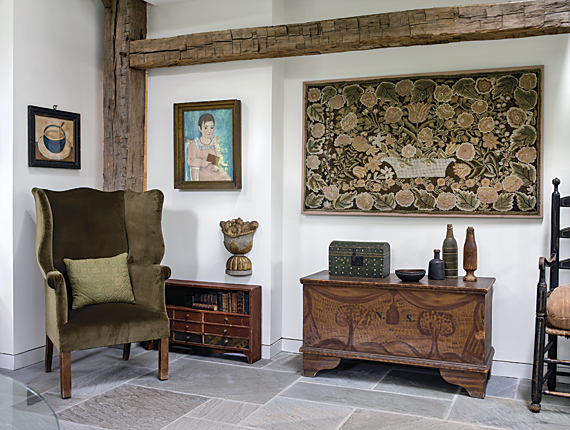 Dominating this wall are a floral yarn-sewn rug and a painted blanket chest. Both were in the collection of Bert and Nina Little. Beside the rug is a circa-1815 watercolor portrait of a girl in pink attributed to Micah Williams (1782/83–1837) and purchased at the Ray and Susan Egan sale at Northeast Auctions. The owner first saw this in A Loving Likeness, the same 1992 exhibit that included the Hamblin double portrait over the fireplace. The collector is always on the lookout for unusual turned and painted forms, such as the rare blue chip-carved bowl and painted treen ware. The dotted paint decoration on the dome-top box is vibrant in its pattering and evokes a smile. One of a pair of glass compotes found separately; probably by the Sandwich Glass Company. Though dating to the early nineteenth century, their form is contemporary in appearance. Each compote is filled with stone fruit of similar vintage. 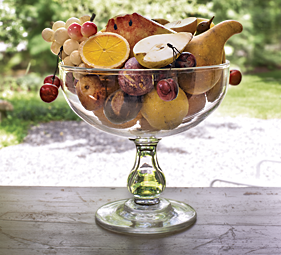 A similar compote is illustrated in Emma Cady’s (1845–1933) painting Fruit in Glass Compote (ca. 1860-1880), at the Abby Aldrich Rockefeller Folk Art Museum. Sunlight flows in from the windows that punctuate this exterior wall. In front of each window is one of a pair of white-painted, demi-lune tables, flanked by Connecticut side chairs with outward splayed crests; from a set of six. The symmetry of the wall is repeated in the furnishings. 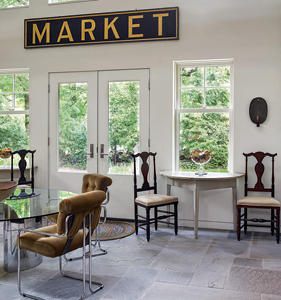 The period table and chairs blend seamlessly with the modern glass table and tubular steel chairs. 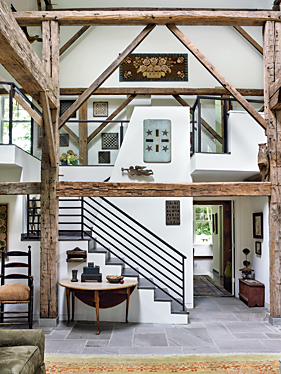 A crew numbered and dismantled the barn, and architect Augusto Morpurgo, of Ho-Ho-Kus, New Jersey, worked with the collector to design a house around the framework of the beams. 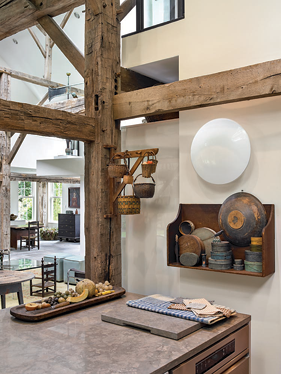 Morpurgo, who has won awards for both his design and remodeling of historic buildings, was eager to combine historic elements with a contemporary structure. The collector had some specific requirements, which included a lot of light, clean lines, and wall space for works of art. One very specific design request centered around a painting. 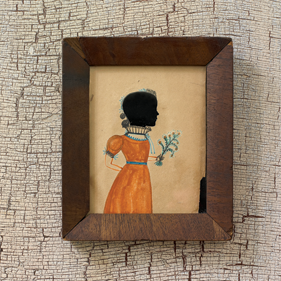 Years before, dealer Don Walters had sent the circa-1840 Sturtevant Hamblin folk art double portrait (The Hathaway Sisters) to the collector for approval. She says that when she took the painting out of the crate, she called Don to tell him it would not be coming back. When her house was being designed, she cut a square out of cardboard that echoed the painting’s dimensions and asked Morpurgo to design a space for the artwork. The double portrait now forms a perfect balance with the shapes of the fireplace and its woodbin in the main living space. Looking out from the kitchen to the main living space, examples of the owner’s favorite miniatures are displayed—hanging berry baskets and Shaker boxes. Color is always a part of the decorative scheme, picked up even in the early textiles on the counter. 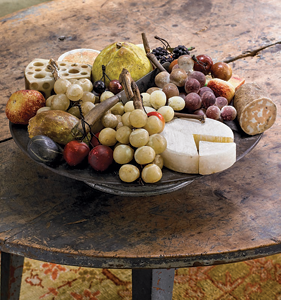 The long wooden tray is filled with “everlasting” stone and wax fruit. The owner is always refining for shape, color, and objects that speak to her soul. Stone fruit is arranged on an “anniversary” tin compote.” Among the fruit are rare forms such as the brie, Swiss cheese, and salami (possibly unique), as well as prickly pear, fig, blackberries, cherries. “What would I grab in case of an emergency?’” says the collector. Her answer? “The Hamblin girls above the fireplace and this standing man.” She purchased the whirligig from the private collection of Don Walters and Mary Benisek while on a visit to their home. “He wasn’t really for sale,” she says. Prior to the Walters collection, it had been in the collections of Barry Cohen and Jimmy Grievo. She was the third or fourth person to respond to an advertisement for the oil painting of the cat with yarn, but the first one to arrive at the shop with a check. The late eighteenth-century child’s blanket chest in original green-black color and hardware was from the Patty and Denny Tracey sale at Skinner Auctions. The owner hung this cutting board as a “contemporary” work of art, the variegated surface echoing brush strokes, paint splats, and Cubist elements. 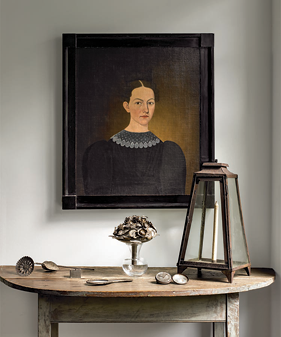 She originally had several other objects on the wall, but distilled the collection to this simple statement. 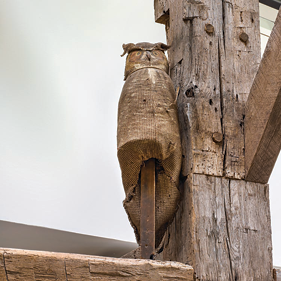 An early homespun (woven linen) owl, nineteenth century, keeps watch in the main living space. Originally intended as a scarecrow, it was covered in feathers, some of which remain to provide a sense for its original appearance. “He is another object that makes me smile,” says the owner. Lining the second-floor sitting room are more of the set of six Connecticut side chairs in the collection and a Windsor bench with original rush seat. 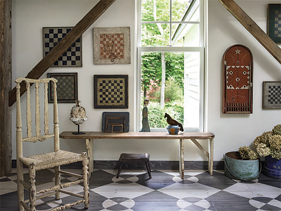 The hand-painted floor is by contemporary artist and historic painter David Wiggins, who painted a number of floors and the main staircase in the house, fashioning them on period surfaces. 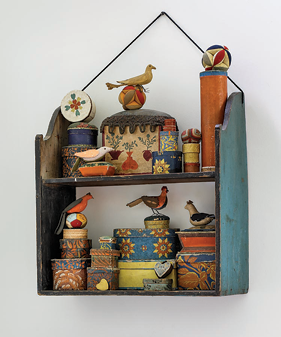 The folk art, by recognized painters such as John Brewster, Sturtevant Hamblin, Micah Williams, and J. A. Davis, along with unidentified artists such as “Mr. Wilson,” and the “Puffy Sleeve Artist,” is displayed on walls alongside game boards, mounted textiles, and weathervanes. 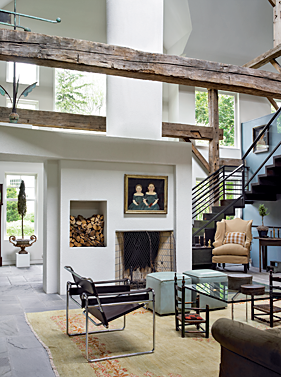 The warmth of the barn beams, in concert with white wall space, and the careful selection of surrounding hanging material, creates a warm, inviting, environment enhanced by the brown, blue, and red color schemes of the art and painted furniture. 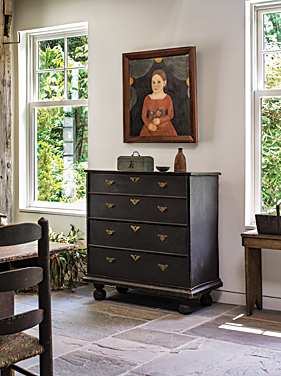 The combination of historic and modern furnishings also adds a dimension to the collection. 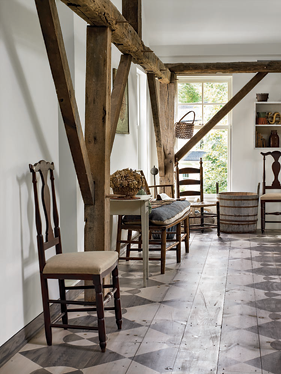 Within the main sitting area are eighteenth-century turned chairs alongside Wassily chairs of 1920s design. Tubular steel chairs, harking to the same period, surround the large glass dining table, acquired because the collector and her husband needed a surface large enough for them both to spread out their respective copies of the New York Times while drinking coffee. When more seating space is needed, two nearby nineteenth-century demi-lune tables are united to create another circular surface. A pair of glass compotes, placed on these two demi-lune tables, might appear to be contemporary, but in reality are early nineteenth-century glass. This seamless blending of periods is a testament to the collector’s design sensibilities, as well as to the point that classic style is timeless and without boundaries. The collector’s grandchildren use the English table in this second-floor space to do homework and play Monopoly. It retains its beautiful pale, bittersweet color. The chairs are blue, one of the owner’s favorite colors. To the owner, her bedroom is a sanctuary. 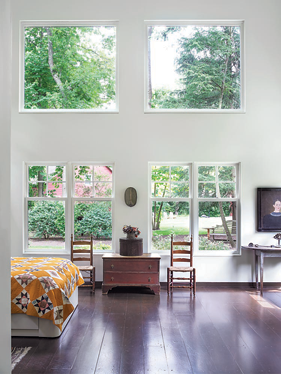 “I wanted the morning sun, so the architect filled the wall with windows, yet left enough white space for balance.” Centered on the wall is a red-painted, eighteenth-century blanket chest surmounted by a fluted Bergen County, New Jersey, hat box with tin basket, flanked by a pair of early nineteenth-century maple ladder-back side chairs, also from Bergen County. “Such side chairs come in all varieties,” says the owner, “but these are the most sophisticated, with heart-shaped crests.” Additionally, their vertical posts are turned tiger maple whereas they are often left plain. All are in original surface. This corner of the bedroom holds a collection of “anniversary” tin. The tradition of making or giving tenth wedding anniversary gifts out of tin was prevalent in the late nineteenth century, particularly in the 1870s–1880s. The elaborate basket filled with velvet fruit (ca. 1840–1870) was in the collection of Barry Cohen; the owner has retained the grouping exactly as Cohen displayed it. “This is one of my most favorite pieces,” says the owner, “I’ve never seen a comparable example.” the other tin items displayed here include a lady’s locket hanging on the wall, a very early wedding-band candlestick, and a hand-held mirror backed with tin. Seen also is a portrait miniature on ivory and an early Queen Ann japanned mirror with gilt trim. The miniature portrait of a young girl (see detail), by “The Puffy Sleeve Artist,” is the only known example where the subject is wearing a red dress. their display. The orange and chrome yellow colors are typical of Pennsylvania boxes. After seeing the wallpaper box collection of Helaine and Burton Fendelman, the collector was inspired to build her own collection. Though the main furnishings garner one’s immediate attention, it is soon evident that the collector has an affinity for “smalls.” Carved and painted birds, “anniversary tin”(made as gifts to celebrate marriage benchmarks), rare and possibly unique forms of stone fruit, miniature wallpaper bandboxes, chip-carved boxes, and turned and painted wooden ware abound. Hidden drawers offer more treasures. For this collector, it isn’t so much about the provenance as it is about an object’s visual aesthetic. There has to be superior form, surface, and condition. The worn handgrip on a chair or the missing color on a wooden bowl indicating use, adds a dimension to the material. 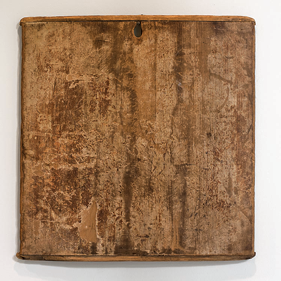 Texture also plays a role in what the collector acquires, being drawn to worn painted surfaces, the silken scrubbed top of a drop-leaf table, or the varied surface of an old cutting board, showing the myriad incisions on its surface. Dominating this composition, also in the bedroom, is a portrait of an unknown sitter attributed to John Brewster (from the Merle Weiss sale at Skinner). The refined form of the demi-lune table, with wonderful early painted surface, holds more anniversary tin: a bouquet of flowers, a hand-held looking glass, a single flower, a sander, pocket watch, and lantern. Once an object is in her collection, it remains unaltered; another lesson she learned from Don Walters. She once purchased a watercolor from him with cracked glass. Asking if she should change the glass, he responded, “Well, Nina would never have touched it,” referring to renowned collector Nina Fletcher Little. She never again thought about making changes to an object.